Here are some plans for a mini Bf-109. The plans aren't pretty, but, feel free to give it a whack. Here are some things you need to know to build it. For the top hatch peel the paper off the bottom side to help it bend. Then for the power pod just sink it in until the motor doesn't show, and then put some BBQ skewers through it to hold it in place. Also 0 thrust angle, at least for the 1306 motor. Now for the poster board you'll have to mess around with it a little bit to see how it fit's. If I try to explain it, it will probably just confuse things. Then do a "B" fold on the fuse and everything should be good! Hopefully you enjoy it, and... HAPPY FLYING! Here are some plans for a mini Bf-109. The plans aren't pretty, but, feel free to give it a whack. No link for the plans. Nice looking build!! There is a little attachment below the picture there. Here are some plans for a mini Bf-109. The plans aren't pretty, but, feel free to give it a whack. Here are some things you need to know to build it. For the under camber on the wings use 3mm, or one foam thickness, for the camber. Also for the top hatch peel the paper off the bottom side to help it bend. Then for the power pod just sink it in until the motor doesn't show, and then put some BBQ skewers through it to hold it in place. Also 0 thrust angle, at least for the 1306 motor.Now for the poster board you'll have to mess around with it a little bit to see how it fit's. If I try to explain it, it will probably just confuse things. Then do a "B" fold on the fuse and everything should be good! Hopefully you enjoy it, and... HAPPY FLYING! There they are. Guess my phone didn't load them first time. So glad to hear that! I think I almost had heart attack. Happy Flying! Yeah, discovered my phone has issues. Looked at this 5 times and 2 times they didn't show. My bad! May your flights be long and your landings always soft! I see it now too. Hahaha! Thanks. Same goes for you! You plane looks really good, great job on the design!!! Would an 1806 be too big for this? I'm pretty sure that will work. You may want to put some thrust angle in it though. Down and to the right like most of the FT Minis? Also, are you running this 3 or 4 channel? It looks like you have aileron cutouts in the wing plan, or is it ailerons and elevators? It's just elevator and aileron. If anybody happens to build it please let me now if there is anything I need to change. Thanks! Also, The elevator servo goes in the green square. I would think so. 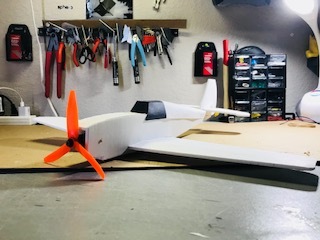 I haven't built it with an 1806 I've actually used a 1306 on 2s with 5 in prop, and it flies great. Oh! one more thing, for the dyhedral use about two inches. I'll probably add some gauges next.